And presumably the last year of this decade since many debated that the last decade began in 2001 and thus that that 2011 begins the next one. And there was never any decision on what to call the first decade of a century. Was there really any debate over that? And just how do we pronounce next year? Everyone's been saying "twenty-eleven," but is that correct or is "two thousand eleven" correct? The "twenty" pronunciation may have fewer syllables, but it just doesn't roll off the tongue the way saying "nineteen __" did in the last century. The novel and movie 2001: A Space Odyssey may be what prompted the "two-thousand" pronunciation used in 2000 to 2009 and it created fewer syllables than "twenty" or "twenty-hundred" or "twenty-oh__" would have had. And "two thousand eleven" isn't as big a mouthful as pronouncing 19__ as "nineteen hundred and __" "or one thousand nine hundred ___" would have been. With centuries, the commonly used English labels happened to use counting terminology: 19th century, 20th century, etc. Some socially inept people, failing to understand the difference between English usage and math, used this coincidence as a basis for quibbling. We don’t label decades the same way as centuries: for example, people refer often to the 1960s and never to the 197th decade. There is no coincidence of terminology to quibble over. Regardless of whether 1970 fell outside the 197th decade from the perspective of a counting quibble, 1970 has never been part of the 1960s in the context of how people use that label to communicate. I was to have tomorrow off, but now have to work to get all the boxes in the warehouse open in time for inventory next Tuesday. We always have inventory after New Year's, but I'm glad it hasn't, as of yet been, on my birthday, January 11. I'll only be working for a few hours, though, and will have Saturday off. Inventory is always a dreaded time for those of us who work in retail and I've been through that industry since 2001. But right after the holidays has to be the worst time for this. Can't wait for that to be over. Meanwhile, here is how my Christmas weekend went. My Christmas Eve with the family and our dinner(with lotto tickets placed at the table) and our white elephant gift game. My cousin ended up with the present I bought--an ice-pop maker from my store. I ended up with hot chocolate mixes from Starbucks. My regular presents from Mom were "The Simpsons Movie" on DVD (I hadn't seen it since it was in the theaters in 2007 and fell asleep when Fox aired it on Thanksgiving night), and gift cards from Target, Kmart, Rite Aid, Safeway and Subway. So far I've only been able to use the Subway one (one of the Subway is across from the park in which I live). Been waiting for the post-holiday shopping to die down before attempting to use the others. Walking into Kmart on Christmas Eve while drying my laundry at a nearby laundromat was an unsuccessful attempt to use my Kmart one, as there were too many people at the store that day. I've been too busy to get to some stores since Christmas ended and am wondering how busy it will be on New Year's Eve and how many stores will be open on New Year's day, a Saturday. Christmas Day I was at home all day, except to cash in my lotto ticket from the night before. I'd won an other ticket, but nothing from the second one. It rained most of the day. The day after was horrible as I suffered from a nauseating headache and was in bed most of the day. Monday was back to work, with the Christmas music gone from the intercom. Our Christmas merchandise is now half off and Valentines merchandise has already been arriving and getting displayed. It seems to have gone by fast. Tomorrow I expect one last Netflix movie for this year (arriving tomorrow) and to hear neighbors shouting and setting off fireworks before midnight. No real plans here and I don't know if the karaoke bar is having anything. And It's expected to storm on Saturday as 2011 rings in. Can't believe it's almost over. You are a complex thinker, and you're good at creating elaborate theories and projects. You tend to have a lot of technical knowledge. You love to learn how to do things. You are innovative and competent. You can often see where others have gone wrong. You are also a bit of a skeptic. You aren't going to believe anything until you've investigated it yourself. In the past I have rambled on about fear of having to go the grocery store on the eve of a major holiday, and have referred to those who do as as either someone who puts off shopping till that day or someone who unfortunately runs out of necessary items that morning. Well, I had to go to to the grocery store today but I had another reason that somehow escaped me earlier--not being able to go earlier in the week because of having to work all week and getting too tired for grocery shopping or other errands. This is what happened to me today. I knew to avoid Safeway because it's the store everyone goes to in my town. I drove past them several times today without even bothering to glance at the parking lot. I knew it would be crowded. Savemart, on the other hand, is never quite as busy as Safeway, even the day before a holiday. So it was Savemart today. It had a number of shoppers, but was far from crowded, not the way I envisioned Safeway being today. The Savemart parking lot had plenty of empty spots and there was barely any pushing and shoving in the store. The worst that happened almost bumping another person's grocery cart and it wasn't even that bad at all. And getting groceries wasn't the only errand I had to do today. My exhausting Christmas-week work schedule put me behind on laundry as well. This was done before my grocery run. My mom kets me use her machine and clothes line, but rain is expected tomorrow (it rained in my neighborhood throughout this week as well), so it meant going to the laundromat to dry my clothes. And I had to make two trips to dry two loads of laundry. I went to laundromat I'd only been to at least once previously. It's never busy and is in the parking lot across from Kmart. Only two other people came to the laundromat today and during my first load, I walked over to a liquor store nearby to get a soda and the lady asked me if I needed help. Just looking, I said, then let on that I was drying laundry. "On Christmas Eve?" she asked. I replied that I didn't have time until today because of work. During the second load I walked over to Kmart since it was the only place nearby with a bathroom. I then looked around in hopes of spending my Kmart gift card (one of my presents today), but I just wasn't in the mood for shopping with all the crowd at the store. Once the laundry was dry I headed to the store as mentioned already, then home to check email, Facebook and write this blog. Have to go now. I wish everyone a Merry Christmas and a Happy holiday season. To view the rest of the ad, click here. All I can really remember about this doll was that she came in a yellow polka-dot sleeper that was unremovable. Her thumb was shaped so it could stuck into her mouth. She came with a bottle with fake milk. You would squeeze her stomach when she sucked her thumb or drank her milk. The ad above says she also kisses, but I don't remember how that worked. I can't seem to find info on or photos of this. The girl smacks the baby's behind because she needs a clean diaper! LOL! I remember having a Baby Alive coloring book, in which a girl named Kathy yearns for this doll. She checks her piggy bank and sees she has just enough money. She tells her dad, "I'm gonna buy a doll." On one page is the caption "Find Baby Alive," with the doll pictured among other dolls and toys on the store shelf. Later on the girl is seen "Getting acquainted" with the doll; "Getting Wet" (she's playing with the doll outside and it begins to rain); taking the doll with her to back-to-school night and to the burger joint. "I like your doll, Kathy" another kid from school says. "What a cute baby" says the man at the burger joint. A friend comes over and one page we see Kathy's dad telling her friend, "Time to go!' This is as much as I ever had of this one. Yeah, baby doll makers really tried to show little girls what being a mommy is like. I just wish I had more info on Baby Be Good. I seem to remember a commercial for the doll, but nothing on You Tube. You're the type of person who just naturally appreciates and respects others. You think ill of very few people. You are naturally open minded and nonjudgmental. You're a good listener, and you end up hearing many secrets. You reach out to everyone during the holidays, and your acts of kindness and generosity are remembered throughout the year. You are easily touched this time of year. Even the right holiday card or little gift can move you. Yes, there were lots of toy that I lusted after for Christmas when I was a kid and there are far too many to write about in just one entry so here is one story for now, with more stories to come later. I will be writing about those I mostly vividly and/or fondly remember. This line originally consisted of eight girl dolls that came in a fashion made with sparkly fabric. A city playset, the horse (seen in the commercial) and four boxed fashion sets were also available. Just before the line was cancelled, two more fashion sets and four more dolls were added, including two male dolls. I never got any of these, but by then I was already tired of toys. Pictures can be seen here, though one doll is not pictured in her original outfit. The one with the long ponytails is one of the later-produced ones. She came in a striped leotard and matching leg warmers, a typical outfit of the 1980s. here she is wearing one of the boxed fashion sets. The other later-produced dolls are not pictured. There were similar to line of small fashion dolls put out by Kenner a year or so earlier called the Glamour Gals. This line consisted of about eight girls. Each girl was produced several times in different outfits. The outfits were not removable, and some were painted on, such as bathing suits and pants. Some outfits were designed the same way in different colors. Two dolls for instance had the painted-on bathing suit, one in orange and the other in a purplish-red color. Two others wore similarly designed cowgirls suits with painted-on shirts and pants and fabric vests and hats. I only had two of these dolls, one I believe was the Shara doll in the sparkly blue dress and one of the Danni dolls, though I don't think it was one of those seen in any of the commercials. Here is commercial with one of the Danni dolls (the user won't allow embedding). More info on this series here. You are a sentimental gift giver. You prefer to give gifts that have meaning, even if they aren't particularly useful. You are spontaneous and impulsive. You tend to do things quickly, and you're quite impatient. You are somewhat organized, but you always feel like you could be doing a bit better! You have high standards for yourself. Your style of dress is whimsical and inspired. You love to play around with different looks. It's Beginning to Look a Lot Like...Valentine's???? This was the title of a blog entry I wrote last year and now the Valentines items are arriving at work for this year. At least this year the Valentine stuff is arriving a little later than last year, but what is arriving is Jelly Belly Valentine candy. Candy for a holiday that is less than two months away? Is anyone going to eat candy hearts, Valentine candy corn and red and white malt balls now, instead of Christmas candy? And some linen items, kitchen towels and pot holders, for Valentines. And yet Christmas stuff is still arriving with the holiday just over a week away. And our store's Christmas display is being reduced down, with garden items taking over the front displays. With Christmas looming, I felt it was time to reminisce about one thing that I as a child always looked forward to as Christmas was on its way. Like a lot of kids, there was always some toy I lusted after and almost always got. My desire for a certain toy always came as result of glancing through the toy catalogs that came through the mail. The only toy catalog I specifically remember was that from JC Penney, which was actually a general Christmas catalog. I would always be perusing the toy section, seeing new stuff and old favorites. I can recall many specific toys and saw in the catalog, as well as advertised on TV, that I desired during different years, something I might just write about in an other entry, as it would take up too much time here. I also recall the footnote that appeared on the bottom of the toy pages in the JCP catalogs, stating that toys are not just for Christmas and that any toy in the catalog could be ordered through sometime in August of the following year. Here are some scans I found from JCP Christmas catalogs. Hmmm, a Jolly Green Giant factory toy set. I don't remember this, but it's certainly not something I would have ever wanted. Then again, this image, I just noticed, was from the catalog from 1972 , when I was only a year old. Would have been too dangerous because it contained small parts. This next image is also form the 1972 catalog and contains an ad for a toy I actually got one year, when I was much older than a year! In the top area area of the scan you can see the Sunshine Family dolls set. This was a long-running toy from Mattel that came with ideas for crafting furniture and other stuff for the dolls out of milk cartons or other objects. Grandparent dolls and pets (a dog and cat set with pet supplies) were also made as were numerous playsets and crafting kits. For more info, see here. Another thing that made me write this story was this blog's entry today on Christmas catalogs from Western Auto in the 1970s. I don't recall ever seeing a Western Auto toy catalog, and only have a vague recollection of the Western Auto store in my hometown, Hollister, California. After Western Auto closed, the building that housed the store then housed a taco restaurant and after that folded, a Chinese restaurant took over the building and has been there ever since. In Gilroy, near Hollister, the old Western Auto sign (with raised lettering and without paint) remains on the back of the building that housed Western Auto. The rear of this building is in the parking lot across from the Gilroy post office. A store such as this was the last place I'd expect to find toys. I also have a vague recollection of staying at my aunt and uncle's house one day and going with my aunt and my cousins into town, driving past the Western Auto store and seeing "Merry Christmas" and "Feliz Navidad" painted on the store window. But I don't remember ever seeing a Christmas toy catalog from this store chain. Similarly the blogger quoted above had scans on his website of toy catalogs from True Value Hardware, another catalog I have no recollection ever seeing. My town has a True Value store (formerly known as Coast to Coast hardware) across the street from my mobile home park. But it has only exited for about 20 years now when it came to town under the Coast to Coast name. There was another hardware store in my town many years that carried toys, and I would always be looking at the toys. So that True Value would have toys at Christmas time does not seem too farfetched. 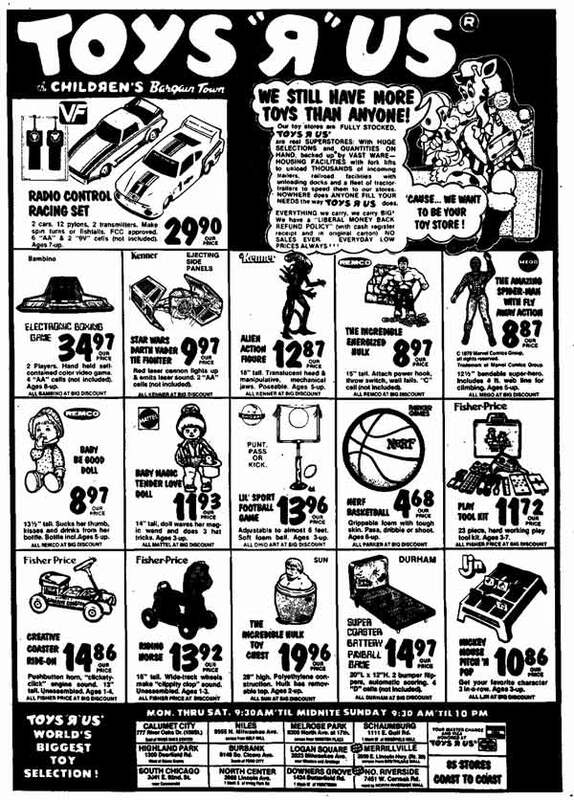 I'm not sure what store it was from but I seem to remember glancing at another toy catalog or flyer that was, IIRC, inserted into a daily newspaper on or around Thanksgiving one year. I know Sears put out such catalogs, but not sure I ever got one of those. And I don't know why JC Penney is the only one I ever seemed to get! My town had one of those old Sears catalog stores, remember those? Going to an actual Sears store meant going out of town. We had a JC Penney store too, until about 15 years ago, as most people preferred going to the larger Penney stores in other nearby towns. Ours was small and had only basic stuff, mostly clothing, very few home appliances, and no toys, even when it was Christmas time. Customers could place catalog orders from this store, however. And while Googling "Christmas toy catalogs," I came across this site of Christmas catalog scans. I gave up on toys when I was 11 in 1982. That was the last year I ever wanted a toy for Christmas. But now I'm seeing toys that came out in the years following that I probably would have wanted had I been younger then. Perhaps this can be the subject of another blog story. And while in my own place of work or while passing through Kmart or Target I often glance at the new toys that are currently in the store. If I had kids, I wonder what they would be asking for and if it would actually be a toy and not video games or Leap Frog pads. And if they would want to read an actual book, not the kids' equivalent of an e-reader. And would I be like Adam Sandler's character in "Grown Ups," trying to them to play a classic board game rather than current violent video games, and be met with remarks of "That sounds lame"? Just an aside, I never played Chutes and Ladders (the game Sandler's character tries to get his video-game-obsessed kids to play in the movie), but was well into Scrabble as a late teenager. Quiz: Which of the 12 Days of Christmas Are You? For you, the holidays are a time of sweet celebration. And you love to sing your favorite holiday songs. You are a joyful person, and your joy multiplies during the holidays. You have so much to be happy about. Your holiday wish is for good times with friends, fun, food, and of course, music. You celebrate throughout the whole season. You truly cherish this time of year. Which of the 12 Days of Christmas Are You? What Does Your Christmas Say About You? You like to party and live it up during the holidays. This is a time to be festive and celebrate. You are resourceful, quirky, and artsy. You like something that's a bit outside the norm. You aren't traditional. You like your holiday decor to have personal meaning. Your ornaments and decorations each tell a story. This holiday season you are grateful and spiritual. You are tapping into the deeper meaning of the holidays. What Does Your Christmas Tree Say About You? What Holiday Drink Are You? Your holiday personality is energetic. The holidays give you a bit of a natural buzz, and you tend to get a lot done. You are an expert on the holidays, and people often rely on you for support. You know the best places to shop - and the best seasonal lattes to drink. 1. “Santa Baby” was co-written by Joan Javits, the niece of Jacob Javits, a Republican Senator from New York. 2. “I Heard the Bells on Christmas Day” is based on the poem “Christmas Bells” by Henry Wadsworth Longfellow. 4. “Do You Hear What I Hear” was actually a protest song of sorts. Written in 1962, the lyrics encouraged peace in the midst of the Cuban Missile Crisis. 5. “Silver Bells” was called “Tinkle Bells” until co-composer Jay Livingston’s wife pointed out to him that “tinkle” is commonly used as slang for “pee.” It was quickly changed to “Silver.” Another interesting tidbit: Livingston and his writing partner, Ray Evans, were also responsible for “Que Sera Sera” and the theme songs toBonanza and Mr. Ed. 7. In “The Twelve Days of Christmas,” the fifth gift of “five golden rings” doesn’t mean jewelry – it refers to ring-necked birds such as the pheasant. The meaning has gotten a little skewed over the years. Also, it wasn’t originally “four calling birds,” it was “four colly birds,” which is a rather old-fashioned term for a blackbird. 8. The song “Christmas Why Can’t I Find You,” later restyled as “Where Are You Christmas” by Faith Hill, was first sung by Taylor Momsen as Cindy Lou Who (pictured) in the 2000 version of How the Grinch Stole Christmas. Yeah, THAT Taylor Momsen. Interestingly, Mariah Carey wrote the song but wasn’t allowed to sing it because of a contract issue with her ex, Tommy Mottola. 9. Aimee Mann’s “Christmastime” written by Michael Penn, Sean Penn’s brother. 10. The Chipmunks’ “The Chipmunk Song” has hit the Billboard Hot 100 over and over, most recently in 2007, when it was rereleased with the new Alvin and the Chipmunks movie. You know the one, but here it is just in case you don’t have a song wedged in your head right now. And here’s the 2007 one, which I kind of hate. All so very weird. "Golden ring" is just another bird? As if one's "true love" doesn't give enough of those already! You approach the holidays with creativity and imagination. For you, it's yet another opportunity to express your glorious view of the world. Whether you're decorating your house or baking cookies, you like everything to have your personal touch. You do your best to make the holidays a unique and special time for everyone around you. Of all the types, you are the most likely to give delightfully surprising and interesting gifts. You're also the most likely to wrap your gifts in an quirky, beautiful way. Quiz: What Color Christmas tree Should You Have? For you, the holidays represent a time of optimism and wealth. You definitely have a generous spirit, and you give a lot during the holiday season. You really go over the top for Christmas. Everyone on your list gets a great gift. Even if you don't have a lot of money during the holidays, it's the one time you pretend like you do. What you should bake for Santa: A ton of cookies, cupcakes, and candy. You would enjoy spoiling him. What do you think of candy corn? I always find myself eating some as it comes out each year. I won some candy corn for Halloween this year in a karaoke bar contest. The yellow, orange and white kind, of course and the Indian Corn variant. Both sell the biggest during Halloween time. But candy corn isn't just for Halloween anymore. It also comes in other color schemes appropriate for other holidays. Right now the Reindeer Corn variety is in stores for the Christmas season. I bought some today at work. We seemed to be out of the the Jelly Belly bagged reindeer corn, but did have some reindeer in small tubes from Williams Bennett, seen in the picture. Other holiday colors include red, white and ink for Valentines Day. I know we'll be getting this one soon, as Valentines items begin arriving as soon as Christmas gets nearer and the Christmas merchandise shipments begin to dwindle. It could just happen any day now. And when Valentines day nears, Easter items will start pouring in, including the pastel-colored candy corn. I know I will be tempted to buy both of these varieties once they come in. Summertime brings lots of sunshine and lots of patriotism in several countries. In the United States, seasonal candy corn with a red, white, and blue motif often become available just as spring gives way to summer, and continues to be available all the way through to Independence Day. As a little extra to sprinkle around Fourth of July picnics and buffet tables, this seasonal candy corn is a quick treat for anyone who is waiting for the hamburgers and hot dogs to leave the grill and come to the table. I don't know why I have never seen the red, white and blue ones. Are they perhaps only available in some regions? No images could be found through Google. Let em know if you've ever seen these, please. Quiz: What Color Christmas Lights Are You? Your holidays are a time of warmth and sharing. No one epitomizes the spirit of giving as much as you do. You enjoy all of the tastes, sounds, smells, and sights of the holidays. You usually have the best decorations, music, and food. What Color Christmas Lights Are You? Quiz: What Crappy Christmas Gift Are You? You Are a Losing Lottery Ticket! Full of hope and promise. But in the end, a cheap letdown. Already the first day of December and I've been to busy to put up my Christmas decorations yet. I'd vowed no Christmas decorations till after Thanksgiving and I stuck to that. But I don't yet know when I'm gonna get to do it, probably on Saturday, maybe Friday night. I already have a rotating fiber-optic Christmas tree. I could easily drag it out of my storage shed right now, but am just too tired for that.